Jobs at Nepal SBI Merchant Banking Ltd.
> Sound experience in investment Analysis and management, Strong quantitative financial analysis skills, Quick decision maker. > Past experience in investment banking/ portfolio management is preferred. 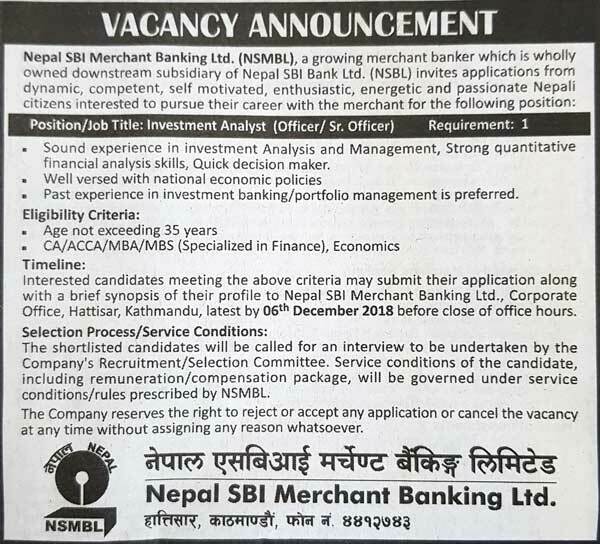 Interested candidates meeting the above criteria may submit their application along with a brief synopsis of their profile to Nepal SBI Merchant Banking Ltd., Corporate Office, Hattisar, Kathmandu, latest by 06th December 2018 before close of office hours. The shortlisted candidates will be called for an interview to be undertaken by the Company’s Recruitment/Selection Committee. Service conditions of the candidate, including remuneration/compensation package, will be governed under service conditions/rules prescribed by NSMBL. The Company reserves the right to reject or accept any application or cancel the vacancy at any time without assigning any reason whatsoever.